The identification, planning and monitoring of customer satisfaction. Continuous improvement of the manufacturing cycle through the monitoring of the quality management system. Tracking, reporting and analyzing of the quality objective data. 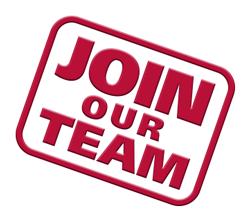 Providing a safe and clean work environment to assist our employees on the mission of improved customer satisfaction. 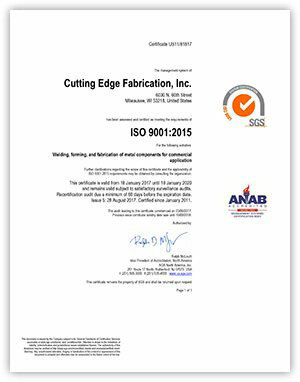 As of January 2011, SGS North America granted Cutting Edge Fabrication ISO 9001:2015 Certification. This allows us to provide the best service, products, and delivery available, not only to companies that require ISO certified shops but to all of our customers. As a certified provider, we can assure each of our customers that every product we produce and assemble will meet the demands of even the most complex specifications. Not only this, but we strive to go above and beyond the requirements of this certification and are committed to performing the best work possible for our clients. We are continually improving product and service quality, on-time deliveries and customer satisfaction. Only by staying ahead of the technology and consistent quality curve can we continue to grow and meet the needs of our customers, now and in the future. It is this type of forward thinking that has served us well for over 25 years. We welcome your visit to our ISO certified facility so that we can show you the Cutting Edge difference. You’ll notice immediately our commitment to quality and customer service. Contact Cutting Edge Fabrication today for more information on our fabrication services or to request a quote! © 2019 Cutting Edge Fabrication. All rights reserved.